Note:This is a aluminum foil production, so it may be caused deformation during transportation,but this is normal. Disposable, don\\\\’t worry to clean it, very hygienic. 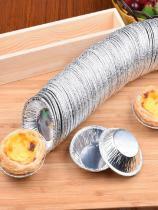 Perfect for pudding, cake, egg tart, ect. Can make a wonderful shape for your food. There are about 250 pieces in each package. Suitable for oven furnace boiler.